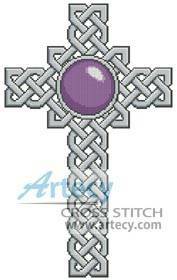 Celtic Cross February Amethyst cross stitch pattern... This counted cross stitch pattern of a Celtic cross with the February Birthstone - Amethyst in the middle was created with the Celtic Knot Font from www.Clanbadge.com. Only full cross stitches are used in this pattern.